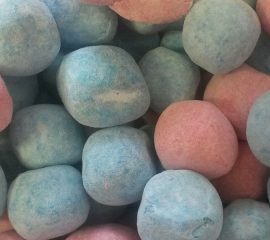 A favourite with all ages, these pink and blue bon bons are sure to take you back to your childhood with their bubblegum flavour! 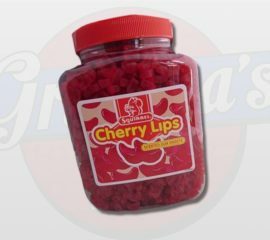 Do you know someone who LOVES cherry lips...then why not treat them with a jar of their own! Each jar contains 2250g - that's a lot of cherry lips to put a smile on someone's face! Do you fancy a jar of something we've not listed - no problem at all! 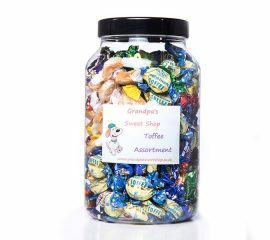 Just enter your sweet choice(s) from our online store into the box below and we'll pop it in for you - we recommend you choose a maximum of 2 varieties for the jar so that you get a decent amount of each but if you want an extra one that's ok too! Please don't mix boiled sweets with jelly ones though as this will affect the quality of the sweets inside. Depending on your sweet choice this could hold anything from just approx 250g - 550g...that's up to 1lb of sweets!! Please note don't select Sweet Tobacco for your jar as the manufacturers of this item recommends it not being kept in a jar as it affects the quality. 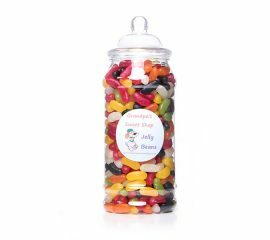 A whole jar full of fruity jelly beans...what more can we say! This jar is 23cm tall with a diameter of 9cm and holds at least 825g of jelly beans - thats a lot of jelly beans! And then when its empty you have a jar that you can fill again!!! You can never just eat one liquorice allsort and why should you have to?! Well now you don't...you can have a jar full of them! The jar is approximately 23cm tall with a diameter of 9cm and holds at least 600g of allsorts, although to be honest you'll probably get a lot more...the perfect gift for an allsorts fan! 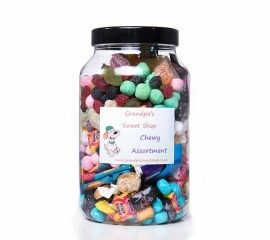 How this for a selection of chewy sweets...it contains a minimum of 2kg of them (although its more then likely you'll get more than that!) so we don't recommend eating them all at once as you'll end up with aching gums!! 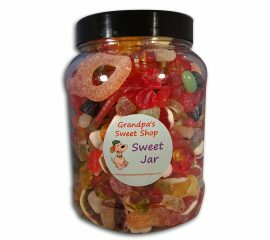 This jar holds a whole host of chewy sweets - from jellies and gums to bon bons and toffees you'll find them in here! The contents of this jar are: Fruit Salad Chews Black Jack Chews Blue Raspberry Bon Bons Watermelon Bon Bons Stinger Chew Bars Vimto Chew Bars Toffee Whirls Wine Gums Jelly Babies Strawberry Bon Bons Toffee Bon Bons Black & Red Gums Giant Fruit Jellies Refresher Chews That's a lot of sweets, but that's why we called it our 'Jumbo Jar'!! 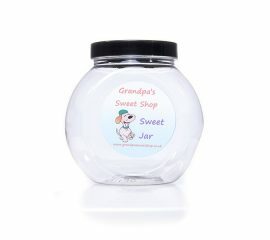 We know someone who would love this jar and we bet you do too!! 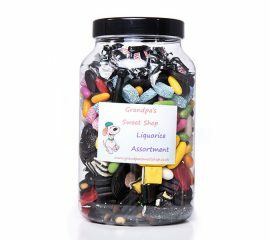 There are SOOOO many types of liquorice out there that we couldn't possibly get them all in one jar BUT we have tried to put a nice selection together in this one for you! This jar is filled to burst and has at least 2kg of liquorice inside - but to be honest you're likely to be getting more then this! 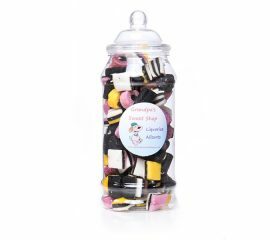 This jar contains: Pontefract Cakes Liquorice Pipes Liquorice Flyers Liquorice Toffee Liquorice Cuttings Liquorice Torpedoes Liquorice Allsorts Cherry Wheels Liquorice Wheels Jelly Buttons Liquorice Cream Rock Catherine Wheels Phew...thats a lot of liquorice! Sometimes we might be out of a sweet (not very often) if this is the case we'll replace it with one of the same great taste and quality! Now this is what we call a toffee jar! Filled to the brim with delicious toffees this jar is simply a must for any toffee fan - it holds approximately 1.5kg of toffees!! The jar includes: English Creamy Toffee Liquorice Toffee Treacle Toffee Mint Toffee Assorted Toffee Selection Nutty Brazil Toffee Milk Chocolate Covered Toffee Plain Chocolate Covered Toffee Toffee Whirls Banana Whirls Occasionally (not very often) we may have run out of a sweet, if so we will replace it with a sweet of equally great taste and quality. Do you love jelly sweets - all those favourites which bring a smile to your face...friendship rings to scary snakes, jelly hearts to fizzy cola bottles which makes you pull a face! Well they're all in in this great jar - its one of our favourites! 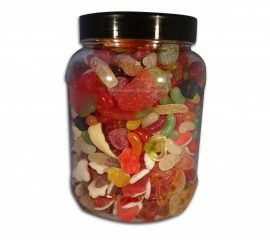 This jar includes: Giant Suckers Yellow Bellies Friendship Rings Heart Throbs Sour Cherries Giant fizzy cola bottle American Hard Gums Black & Rum Gums Gold Bears Giant Strawbs Jelly Beans Fruity Frogs Phew...that's all of them we think! This jar contains a minimum of 1.7kg (thats right a MINIMUM! )...that's a lot of jellies to keep someone happy - they might even share them! The jar is 13cm in diameter and makes a great present and really looks the part! Its got all kind of uses after too (although you might just want to keep filling it with sweets - we wouldn't blame you!) Occasionally (not very often) we may run out of a particular sweet, if this is the case we'll substitute it with another of the same great taste and quality.